If your family just doesn’t understand how important a good golf trip is, then grab some buddies and make the trip. We’ve outlined a lot of great golf courses and resorts in other articles, so if you’re looking for a destination, just check out any of those articles. This time we’re getting down to the nitty-gritty. It’s important that every single one of you knows what to expect, because if you’re going to be spending a lot time with each other, you don’t want any surprises. If you’re a normal group of friends, you’re probably all competitive with each other, and that’s fine and healthy. That what makes the game so much more fun. However, there’s a line that you need to make sure doesn’t get crossed. Don’t invite that one guy who likes to get boozed up by the second hole and then wants to fight everyone after they score their third-straight double bogey. Make sure you all know what you’re getting with each other. The last thing anyone wants is to show up to their resort and find out it’s made for romantic getaways and has only rooms for lovers. The awkwardness is not something you can put to the back of your mind when you’re about to tee off. Do your research. Find the best place at best price for you. If you’re not going to spend half your savings on your family, it’s probably best if you don’t do it for a weekend of golf. We all have that one friend who is late to everything. Now that’s fine when you’re all meeting up to watch the game, but when time and money is on the line, it can’t be tolerated. Don’t let your friends slack off and keep pushing back your tee time. Schedule everything out, and stick to it. Yes, the resort you’re looking at may look nice, but no matter how much time you spend golfing, you’re going to spend even more not golfing. Make sure there are things to do when you get back to the room so that you’re not forced to read old magazines or watch PBS on a 10-inch television screen. 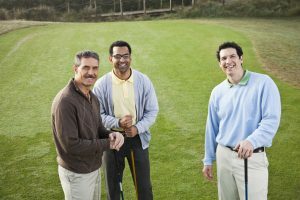 A good golf trip with friends is a fun experience. But in order to make sure it goes smoothly, a lot of planning needs to go on beforehand. So don’t plan a trip at 2 am when you’re drinking in your garage. If you’re serious about it, then be serious about it. PreviousWhy is Golf the Best Sport in the World? Incredible Trick Shots Video with the Bryan Bros.